If you’re going to bring your food and coffee to work, then you’ll need to find a way to keep it as fresh and warm (or cool) as possible. The only way you’ll manage to do that is with the help of a small thermos. A small thermos is great for taking hot or cold drinks on the go, especially if you want to save something for later or parcel it throughout the day. But not all Thermoses are created equal. Some are easy to use when driving, and some are great for enjoying your lunch. Some are easy to clean, while others are made of a million small parts. That’s why we’ve taken the time to find the best small thermoses for everybody’s needs. Heads up: thermoses are great for saving money. Why would you buy a $5 coffee during your work break, when you can bring a coffee from home for much cheaper? Since all of the thermoses that we’re suggesting run under $30, the money that you save on coffee or tea could easily pay for your thermos in less than a week. Zojirushi, the company that’s become famous for their hot pots and rice cookers, has reapplied their vacuum insulation technology to the world of beverages. While it’s common for old-fashioned tumblers to create a vacuum seal (to control temperature and prevent spillage), it’s not very common for tumblers with push-button lids to have reliable vacuum seal technology. It’s nice to know that you can throw this easy-to-open mug in your bag without getting flaming hot coffee all over the place, especially at a $23 price point. 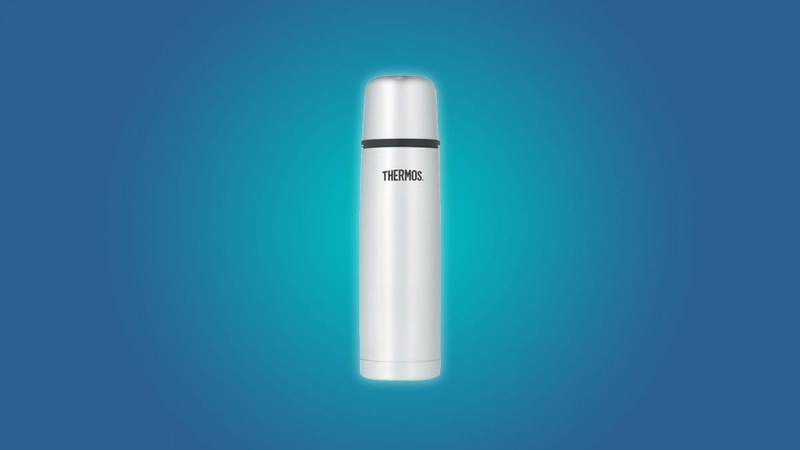 It’s also nice to know that this thermos can keep your drink hot for up to 12 hours, which should be more than enough time to get most people through their day. 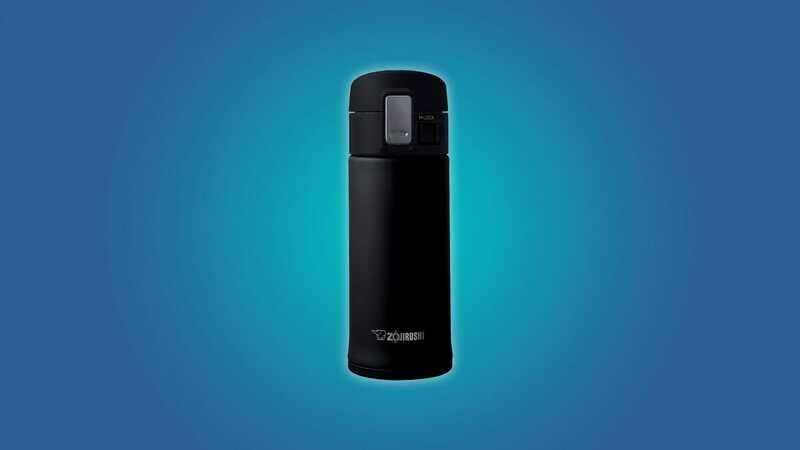 When a thermos looks a little bit complicated, you can bet your luck that it’s difficult to clean. Tumblers that have mechanical tops, like the Zojirushi, are usually made up of a handful of rubber gaskets, plastic lips, and hinged lids. Although the Zojirushi is made up of 5 separate parts (three of them are small plastic parts) they’re easy to separate, clean, and reassemble. To most people, the convenience of a push-button lid and a tapered lip are worth cleaning a few tiny parts. Especially if you’re always walking or driving around. 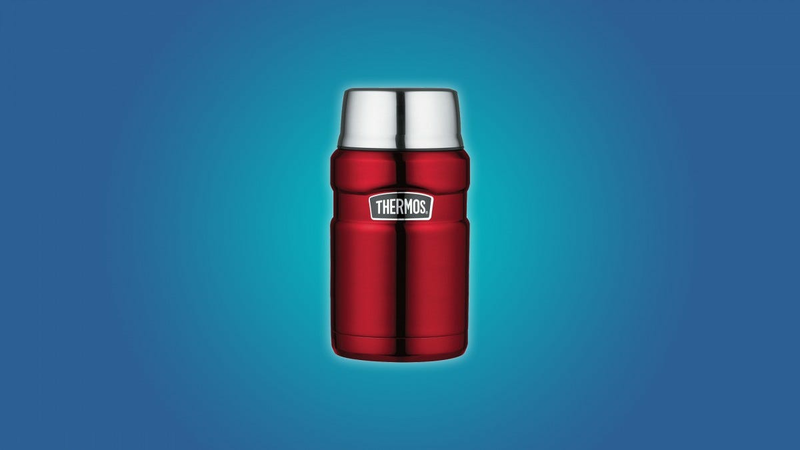 If you’re looking for a thermos that feels both classic and contemporary, then you should check out the Thermos brand compact 16 oz tumbler. It has all the earmarks of an old Thermos, including a lid that doubles as a cup. But the mug also looks stylish, and it has a plastic stopper that prevents any kind of spillage, even when you forget to fully tighten the lid. The stopper can also double as a spout if you don’t fully unscrew it. Think of a pitcher of creamer at a coffeeshop. The obvious drawback to this tumbler is that it isn’t convenient when driving or walking around. You’d have to unscrew the cap, unscrew the plastic stopper, and then try to drink out of the mug slowly enough that you don’t make a giant mess. Of course, there’s also benefits to this design. For one, this design is great for parceling the contents of your thermos throughout the day. It’s fantastic for a lunch break (when I see these, I think of Fred Flintstone on his break), and it’s really nice for sharing. The design of this Thermos also makes it easy to clean, because everything in this thermos (it’s only 3 parts) can be dumped in the washing machine without getting lost or damaged. 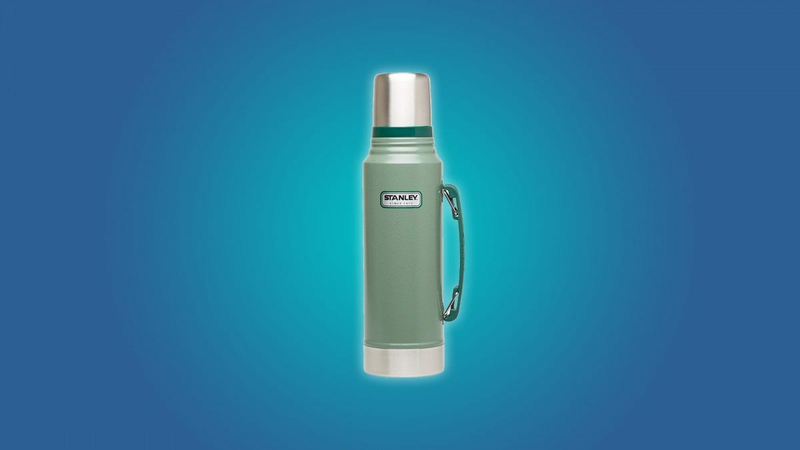 The Stanley vacuum bottle is a classic, outdoorsy thermos. 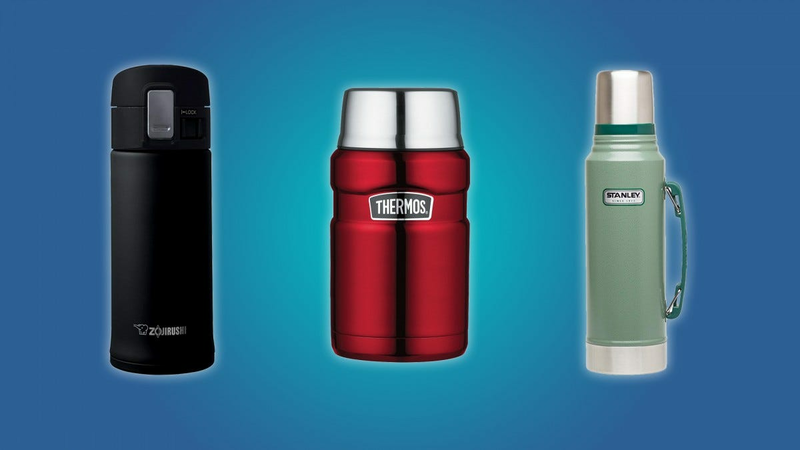 It’s easy to understand why this style of thermos is still recognizable and relevant. It’s durable, it’s simple, it has a handle, and it insulates drinks with gusto. Like other sporty, old-fashioned thermoses, the Stanley has a large cap that doubles as a cup, and a stopper that helps maintain a spill-free vacuum seal. You don’t have to worry about spilling your hot coffee when you’re far away from home because the Stanley’s stopper can be used as an easy-pour spout. Plus, this tumbler has a handle, so it’s easy to control how your liquid comes out. Like other old-fashioned thermoses, the Stanley is mostly made of stainless steel, so it’s very durable and easy to clean. This tumbler has one gasket, and it’s connected to the plastic stopper, so you don’t have to worry about losing the gasket in the dishwasher. If you’ve bought a cooler or a thermos in the last few years, there’s a good chance that you bought a YETI. The brand has enjoyed a ton of popularity with outdoorsy types, and for good reason. 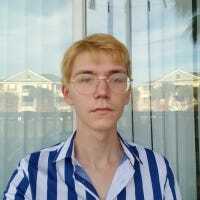 Their products are extremely straightforward, they work really well, and they don’t break easily. The YETI Rambler has found its way in many backpacks, trucks, and boats, because it’s big, easy to clean, and pretty durable. In fact, this tumbler is only made of two parts, and the lid doesn’t have any annoying gaskets for you to clean or keep up with. The only drawback to this tumbler is that it doesn’t insulate as well as you might expect. See, it’s made with a pretty thin stainless steel that hasn’t been filled in with insulating material. This makes the bottle very light, but it reduces the length of time that your coffee is going to stay hot. And since the YETI isn’t made with any rubber gaskets, the heat (or cold) that you’re trying to control can easily escape through the top of the bottle. 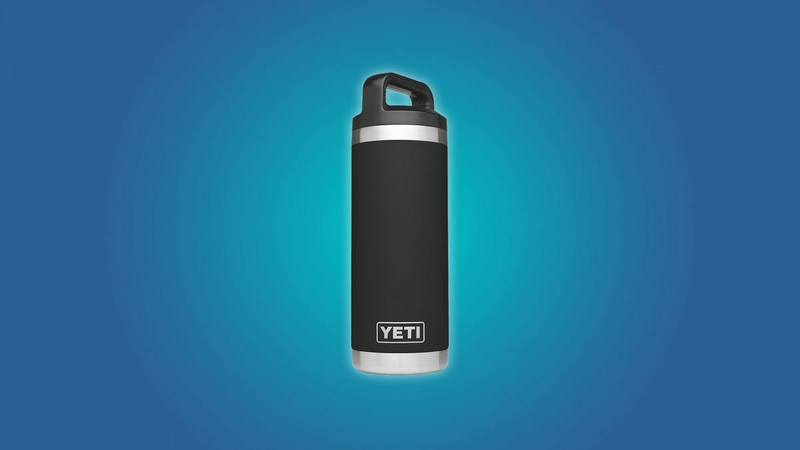 Of course, the YETI will insulate your drinks for a couple of hours, but it won’t keep your coffee warm for half as long as a heavier insulated thermos will. Still, it’s durability and wide mouth are appealing. Insulated food jars are the unsung heroes of outdoorsy-folks and lunch-packers. The Thermos brand food jar is a particularly great bottle, and I’m sure that it’s held a place in many people’s lives. The food jar’s wide mouth makes food transfer a breeze, whether you’re dumping food into the Thermos or pouring it into the lid that doubles as a bowl. These things aren’t just for soups and noodle dishes. They’re also fantastic for smoothies, coffees, and teas. You can pack one of these in your bag and take it to work without worrying about the container leaking or sweating all over the place. This Thermos won’t fit in your car’s cup holder, but we’ve already established that old-fashioned Thermos brand products are best for when you’re sitting down, not running around. Oh, and don’t forget, this tumbler is only made of three, cleanable parts. The lid, the stopper, and the jar itself. And you know that this thing’s easy to clean, because it’s so dang wide. Perhaps more than most consoles, the Nintendo Switch is designed to be played together. These are the best games that you and your friends can play together on the couch, or on the road.